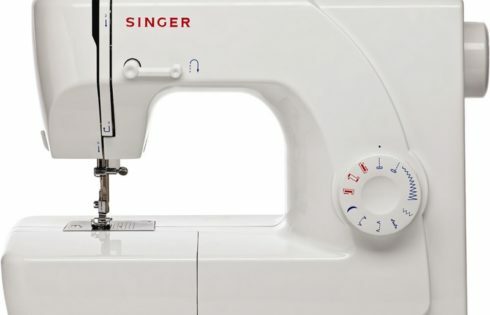 Attractively priced at less than $100, the Singer 1507 is an easy-to-use basic sewing machine that is meant for novices who are just finding their way around with sewing as well as for veteran sewers looking for a portable machine. It does everything you’d expect from a basic machine and a little bit more. With this simple, economically priced sewing machine, Singer has once again proved that they are dedicated to putting sewing within affordable reach of everybody around the world. The Singer 1507 is everything Singer claims it to be – a steady, portable machine that is easy-to-use. Basic it may be but that does not mean this is a mediocre machine. The Singer 1507 sewing machine comes with a pretty neat combination of features that works well for beginners with enough versatility for the seasoned pro. Eight Built-In Stitches: 8 built-in stitches offer a decent variety of options for decorative or fashion sewing and for crafting. Quick and Easy Threading: The Singer 1507 had a numbered guide and arrows that make threading super easy. If you’ve never threaded a machine before, this takes away the guesswork. Just follow the arrows and you’re done! Variable Stitch Length: You can adjust the length of the stitches can be adjusted to make them more appropriate to the fabric so it does not bunch. Variable Zigzag Width: The zigzag width can be adjusted up to 5 mm depending on the fabric as well as the look you are aiming for. A larger width can make the stitches appear bolder and more pronounced. Automatic Four-Step Buttonhole: Buttonholing is the one area of sewing that even experienced sewers find daunting and for beginners, this can be a total nightmare. The automatic-four-step buttonhole feature takes away the frustration for sewers of all skill levels and gives a professional finish every time. Variable Needle Tension: The needle tension can be regulated for stable stitch quality on any type of fabric. This is a very convenient feature when working with special projects that involve different types of fabric that require different tension settings. Variable Needle Position: A convenient feature that helps when inserting zippers and also for projects that involve topstitching and cording. Adjustable Presser Foot Pressure: An easy to use dial that helps regulate the amount of pressure exerted on the fabric, ensures that you can sew from the lightest of fabrics to the heaviest fleece with superb results every time. Extra-High Presser Foot Lifter: Another fantastic feature that gives you the additional clearance you need when placing extra heavyweight fabric or several layers of fabric under the presser foot. Snap-On Presser Feet: You can easily change from one presser foot to another for different projects without having to use a screwdriver. Easy-to-use Foot Pedal: With this easy to use foot pedal, you can go as slow or as fast as you are comfortable with. A great feature for beginners who may want to start off more slowly and for professionals for whom speed is of essence. Heavy Duty Metal Frame: The heavy duty metal frame ensures that the machine will easily withstand all the heavy duty sewing you throw at it. Free Arm with On-Board Storage: The free arm makes it easy to sew cuffs and pant hems and the storage puts the accessories within reach for when you need them. Easy to use and lots of convenient features at an attractive price tag of less than $100, makes this machine an out and out winner! This is a great sewing machine for beginners or for the enthusiast on a budget. If you are looking for very advanced features, this is not a machine for you. The Singer 1507 sewing machine is an excellent all-purpose, low-cost machine that works well for beginner and for simple sewing household sewing projects.